And so all good things must come to an end! However, although this might be the end of Sophie’s Universe, it is only the start of your journey; be it a journey of learning, a journey of healing, a journey of friendship, or a journey of discovery. 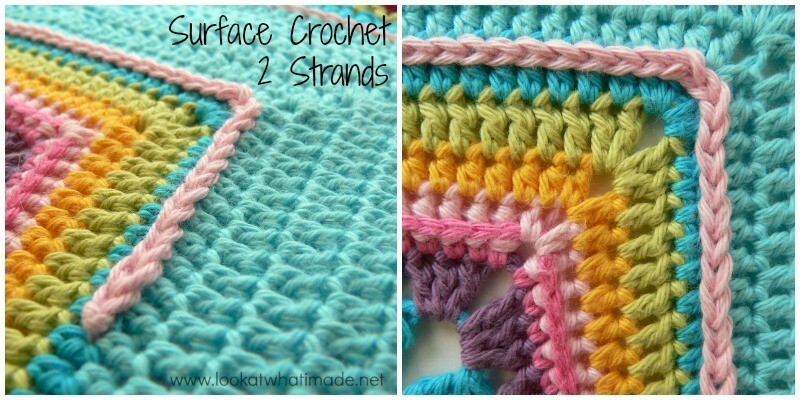 We are going to chat about the Surface Crochet quickly, for those of you who are eager to get going. After that I will prattle on about Sophie a wee bit more (because there are people to thank and tears to be shed – at least on my part). Use the Print-friendly button at the bottom (right) of this post to print/save this tutorial. Don’t know how? Find out HERE. In Parts 13 and 15 I gave you the option of making Rounds 91 and 98 as back post stitches instead of regular stitches. If you chose not to make those rounds as back post stitches, and now regret your choice, I am offering you a chance to “correct” it (without frogging all the way back to Part 13). 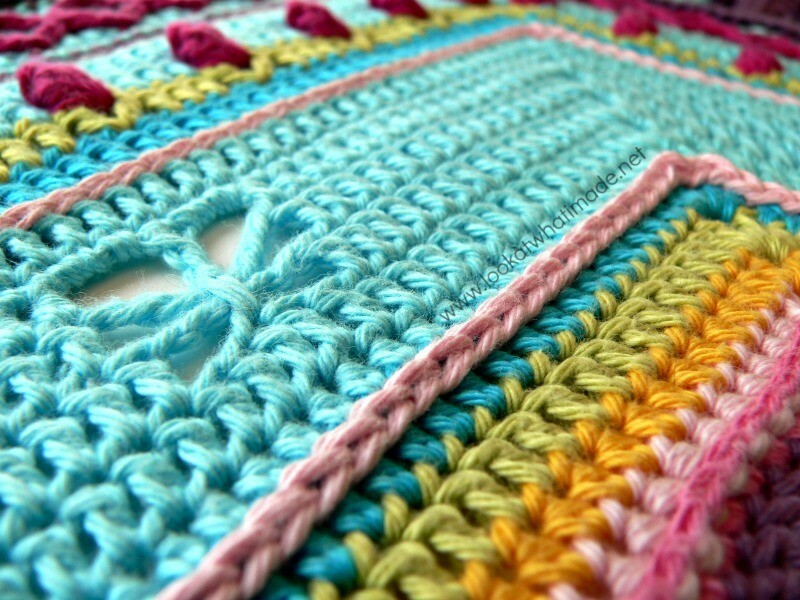 This “second chance” takes the form of Surface Slip Stitches. I have used Light Pink so that you can see the effect more clearly, but if I were to do this properly, I would use the same colours I used for Rounds 90 and 91. This is just personal preference and you are, of course, free to use any colours you like! 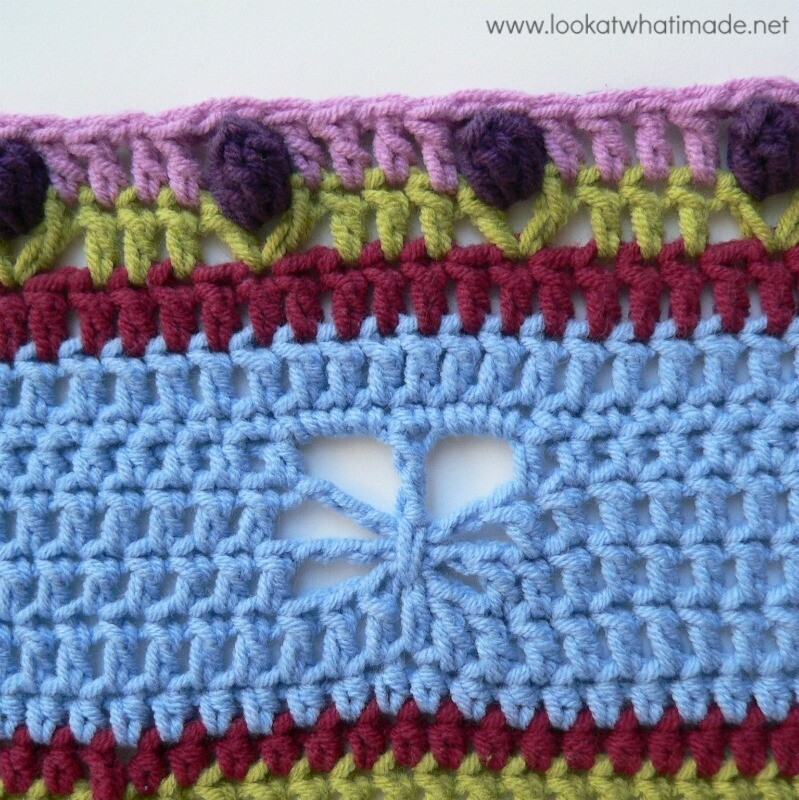 If you have never used Surface Slip Stitches, you can find a tutorial for it HERE. 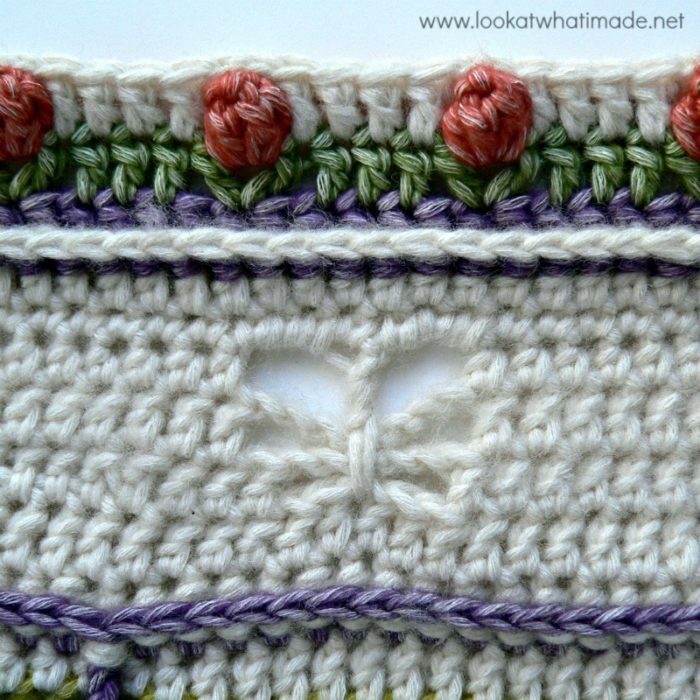 If you are going to use surface slip stitches to highlight the Butterfly Band, I suggest that you use 2 strands of yarn at the same time, instead of one. This will make the stitches “pop”. Although the stitches are visible, they do not add surface interest. They just melt away into the background (unless you use a different colour like I have done). Although I have used the same hook as above, the stitches are “fatter” and make more of an impression. Using 2 strands like this will look good even when using the same colour. Below you can see the difference between using 1 strand and 2 strands. I know there has been a bit of controversy about the Optional Flowers, but I quite like them. The main reason I left these ones until I was finished was because I wanted to look at my blanket as a whole before deciding which colours to use. I ended up making them in the same colour as the first lot of Optional Flowers (in Part 4). And here you can see all 3 bits of Surface Crochet. I had originally planned to do another bit of surface crochet around the points of the 4 Petals formed by the Long Sides, but Mr. Lookatwhatimade was adamant that it wasn’t needed. He is right. He is usually right. I spent the last week in “turmoil” wondering if I should include it or not. I decided to heed his good council and leave well enough alone. So now we are officially (and unofficially) done with Sophie’s Universe. I would love for you to end Sophie on a “BANG!” by sharing a selfie with your sophie, using the hasthag #Selphie. 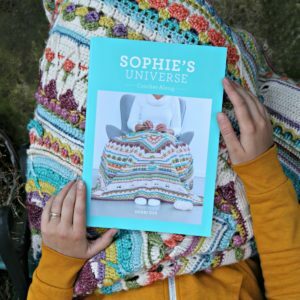 If you have made Sophie using Scheepjeswol yarn, you can also use the hashtag #sophiesuniverseselfie. This post has been so hard to write. In fact, the translators will only be getting this post after it is posted. Every time I sat down to write it, I just ended up staring at the screen. There are so many things I want to say…too many things…unnecessary things… So I will try to keep this semi short. Sophie’s Universe has been an amazing journey for me. I never expected people to respond so positively to it, and to give their time and expertise so selflessly! This crochet-along has blessed me in so many ways. I have made amazing friends; people who, I hope, will be in my life for years to come! I got to see the world through your photos, which were creative, personal and beautiful! Through the South African photos, in particular, I got to feel closer to “home” than I have for years. You were selfless and honest in sharing your joys and your sadnesses, and you have been absolutely amazing in your determination to learn, and your willingness to help and encourage others. What struck me most was how many of us have been helped through a dark time with this project. Your stories have blessed and inspired! I would love for you to continue inspiring others, so if you have an uplifting or inspiring story to share about your Sophie journey, please share it using ‪#‎alongcamesophie‬. 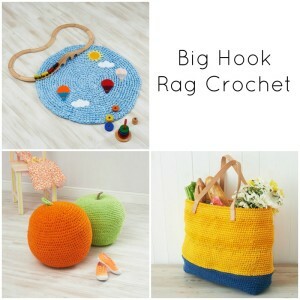 If you have an uplifting or inspiring story to share about any other crochet project, please share it using ‪#‎alongcamecrochet. This pile of goodness represents over 1000 hours of work (not including the testers, translators, and Esther from It’s All in a Nutshell, who did the wonderful videos as if she was sitting right next to me!). I am unbelievable proud of having completed 3 Sophie’s (4 if you count the prototype) and immensely grateful to Jenny and Kay for helping me when I just didn’t have enough hours in the day. I am also so very proud of each and every one of you who have completed her! I sincerely hope that you have enjoyed this journey (voyage, challenge, pattern – whatever you choose to call it). 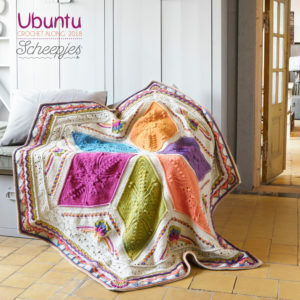 I hope you will be able to apply what you have learnt to other patterns, and that you will continue to encourage and inspire others with your love of crochet! Keep on keeping on, my beauties, and let’s show the world that crochet heals! Who Helped Make This CAL Possible? This bit is super important, because without these people the CAL would not have been what it is. Everyone is always thanking me for the CAL, but these people have given so much of their time (and themselves) to make it happen. I cannot begin to tell you how grateful I am for their help! 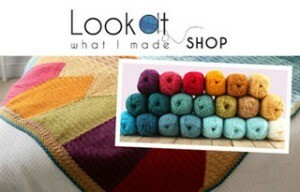 Yarn Packs – Deramores and Wool Warehouse have kindly put together Colour Packs for this CAL (You can find them HERE). 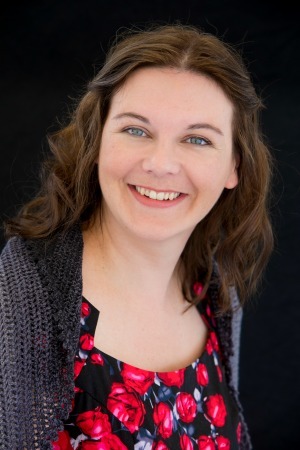 Participants – Most importantly I would like to thank each and every person who made Sophie, and who helped others with their questions and concerns. You guys have been such an amazing, caring, encouraging group! Each and every one of you should be immensely proud of yourselves, both for making the blanket and for helping others to do so too! Just made 4 Sophies garden and i would like to make the univers. But looking at what others have made make me change my mind. So many pictures of unfinished blankets and many of them are bulging. My 4 gardens came out fine. Should i try? Why arent some of them unfinished. Hi Dedri! Just finishing up the last row this week. What a crazy amazing pattern! when i first saw this i thought there’s no way i can do something that complicated, but you showed me i can do pretty much anything as long as i take it one row at a time. I found this project when i was having a really hard time at work, a lot of folks had gotten laid off and i was over whelmed with the new responsibilities. Sophie really helped when i just came home and spaced out decompressed from a day of things not going right. When i finished it I thought whoa this thing is really wild, but it felt like i had put all those out of control feelings into it, and that some how it was a reflection of how i had been feeling over the last 6 months. im happy/sad that it is over. thanks so much for putting this pattern together, Sophie and i found each other at the right time. Thank you so much for taking the time to share your story with me. 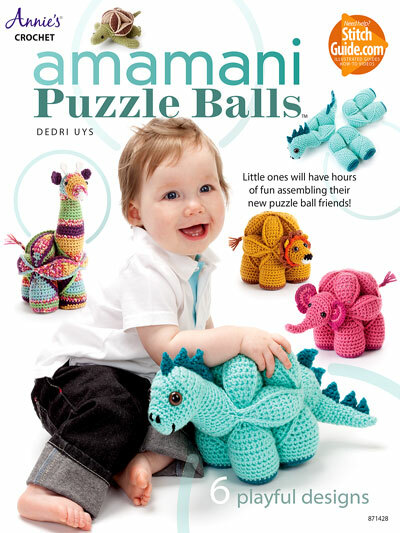 Everything you have said is exactly why I designed this pattern and put it online for free. I am so pleased that this journey has helped you and that you were able to take all those feelings and turn them into something positive and beautiful. I hope that you will remember your strength every time you look at your blanket. I also hope that things at work have improved for you. What an awesome design! I am new to finding it so looking forward to all of it. I did have a problem when trying to download part 8. it will not download all of it. it stops at the colors. is the post damaged? Hi Deborah. I just tried the post and downloaded it successfully via the Print Friendly tab at the bottom of the post. I hope you get it downloaded alright. I’m a fairly new crocheter. I’ve knitted for many years but never knew how to crochet. My sister-in-law taught me the basics about 2 years ago and I am “hooked” proving that even old dogs (I’m 77) can learn new tricks. Your Sophie pattern really interested me! I started it using just my large stash of yarn. I’m on Part 12 and it is coming out so great and it is so much fun to do. I was thinking of trying to make it Queen bed coverlet size. I think that will be something like 90 inches square. I wonder if you can give me advice as to how many stitches to increase each side to achieve the size I need. I thought I could use all double crochets. What are your thoughts about this? Thank you so much for sharing your creativity!! 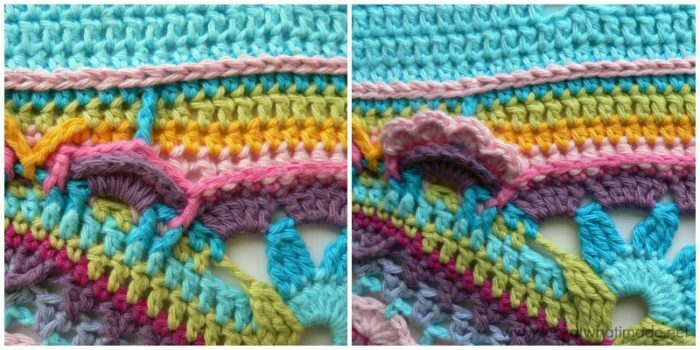 Parts 19 and 20 give you options for extending your Sophie to make her larger. I have just finished my first Sophie, and what a journey! I had to give up smoking at New Year ready for spinal surgery in February. This project kept me on the straight and narrow for those six weeks leading up to surgery and have given me something to keep my mind going since, which kept me sane to be honest as recovery has been much slower than I anticipated. It did take me all longer than the 20 weeks for obvious reasons, but I still feel a huge achievement in completing it. I suspect I might feel a bit lost tomorrow now that I am finished, so I now need to look for a new project! So, I would like to say thank you! Thank you for creating a project that helped me through a particularly difficult time. Hello, this is what I am looking for the pattern for, this border. So sorry, but I can’t seem to find it. Thank you so much, it’s just so beautiful, I love it! Do you mean the butterfly band? That is Part 13, 14, and 15 of Sophie’s Universe. Thank you so much for sharing this beautiful pattern. I have followed both pattern and watched Ester’s video when I was not quite sure. The diagrams and explanations have been fantastic. I was taught many years ago by my Grandmother’s friend how to make granny squares. 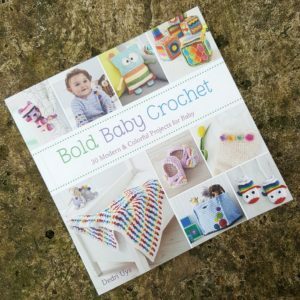 30 years on I began to crochet again, it began with baby garments and simple block square projects. 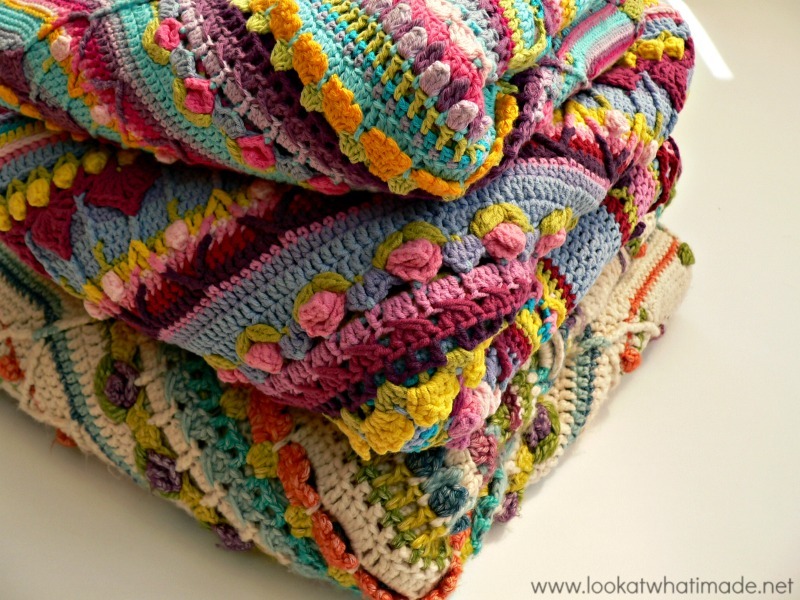 I began not really wanting to make throws or Afghans and felt frustrated that there were so many of these types of patterns. I did my first crochet along with Mikey from The Crochet Crowd. I also learned to read patterns in the last couple of years. When I picked up a hook about 3 years ago, I could never have imagined making such an intricate piece of work, I feared such skill would be beyond me. My confidence has grown immensely over this project. 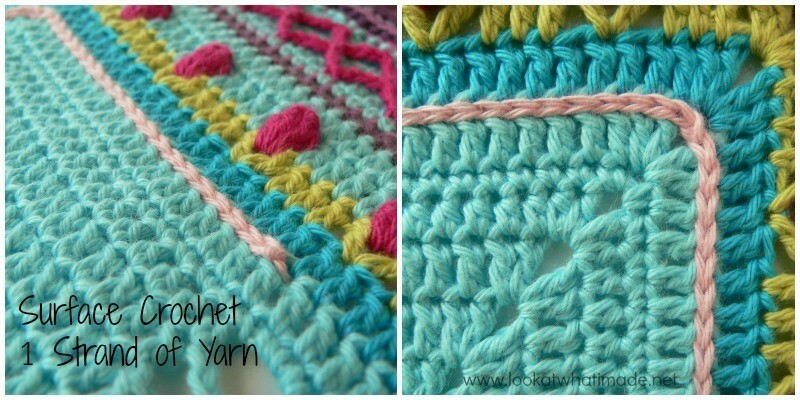 I have thought about sharing this skill and would really like to design a simple crochet along for beginners. I now how the confidence to sit down and work out lesson plans for beginners. Thank you once again. I am so pleased to hear that, Lorraine. I wish you lots of success with your first crochet-along. One piece of advice I can give you is to find good testers that you trust. It will make your life MUCH easier. I’m sitting in front of my laptop, crying. I am so touched by this last part and the heart-warming stories of all the fellow sophies. 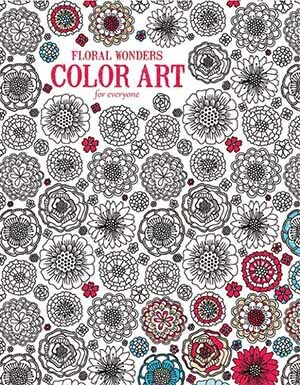 Now I have to confess that I just wanted to have a sneak peek at the last part, I have only nearly finished part 3 in a two-coloured (red/yellow) and part 2 in a multi-coloured Sophie. Today I will begin the crabstitch round, again something new for me. Thank you for taking me on this journey! I love the way you explain. I found out a special reason why I love to work on my Sophies: they change with every new round added but when its added its there, finished, no putting together some day later in the far future. Thank you Dedri and all who made this possible. I feel like i know you!!! Thank you so much for sharing all your wonderful ideas with me. I have had the most incredible journey with this project. 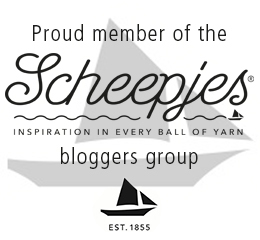 I have learnt soooo much – stitches I have never even heard of. You are absolutely amazing and I want to thank you for the incredible enjoyment I have had with this project. I do believe that you will be coming to SA in ahe near future and simply cant wait to meet you. Thank you again for your amazing inspiration. Namaste Dedri. 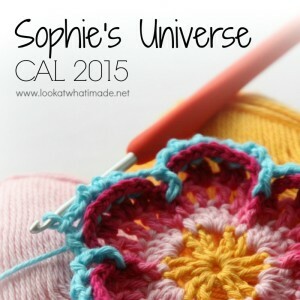 I had written to you earlier about starting on Sophie’s Universe. I did make it, but with some changes. 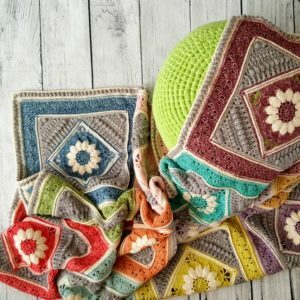 I used the Sophie’s Garden square in the center, made 4 corner squares using some of the stitches in the Garden Square and added some stripes. I think it has come out beautifully :-) I would love to share it with you. Please let me know where I can post the picture. Thank you so much for this beautiful pattern, which you have given so freely and lovingly. God bless you and yours. Hi Ranji. That sounds gorgeous. You can use the Contact Me tab at the top of the website to send me a message, I can then respond, opening a line of communication so that you can email me a photo if you would like. I’m fairly new to crochet and have decided to give Sophie a go. I would like to work it[or should it be her?] in Stylecraft Special DK as I cannot use anything with wool in it. My husband has offered to buy me the wool for my birthday but I have no idea how many balls or colours to ask for, can you help? Diana, it is up to you how many colours you use. I am making a Stylecraft DK Sophie in one colour and ordered 15 balls to make it up to the round that doesn’t include the extra squares and borders. I’ve never seen a pattern like this one and just had to try it. This is a beautiful pattern I love it, all the girls in my family want me to make them one to display in their homes. I’m still working on my first Sophie, I’m on row 76. I started it because I wanted to do something different than afghans & mandalas. It looks okay so far except for the rows that are circular, I used 3 different blues and 3 yellows & now it looks strange with all the other colors I’ve been adding following your patterns suggestions. How can I fix some of the circles so it blends in better? Keep up the good work.& thanks for any suggestions. Joyce, I am sorry to hear that you are having difficulty with colour placement. If you use the Contact Me tab at the top of this site to send me an email, we can open a line of communication so that you can send me a photo? Unfortunately I cannot help you if I don’t know what your Sophie looks like. Dear Dedri. I am still going. Upto round 12 now. Was rather sick and not touched Sophie over a month but staeted again . Are you going to start sonething else with us again soon? I hope you are feeling much better now, Elize. I am taking a bit of a design break to focus on other things, but I will host another CAL…I just don’t know when. Oh, how I have LOVED making my Sophie! It’s been wonderful. I suffer from Meniere’s Disease, and you have no idea how much making my Sophie has helped me keep focus and keep my eyes and brain from being too dizzy. So, in this sense, it’s been such a help. I was wondering what to do with my finished Sophie, and all of a sudden, I decided to auction it, in aid of the school my 8 year old son goes to, for Autistic children. They are always trying to raise funds for things that the government here in the UK won’t fund, so I hope it brings some well needed cash. Thanks so so much for all your time and efforts during the CAL (and all those who helped you too). I’ve loved every moment. Samantha, thank you for sharing your story with us. I am so happy that this pattern was able to help you with your dizziness. It must be horrible to always feel dizzy! I hope your blanket brings in a lot of money for your son’s school. You and Sophie came strolling along just when I needed you the most! You see, I broke my knee in early december and was so incredibly bored by sitting, not being able to move around (like one does without thinking much of it). So I decided to accept the challenge that was Sophie. At first I didn’t know what to do with the finished blanket, but somewhere around the crab stitch-row I decided to give her away to a sweet little girl! That girl (she is about 10 years old) felt sorry for me when I broke my knee and made me a key chain macramé fob and I wanted to give something back. So thank you for Sophie and for all the joy she gave us! Making it was fantastic and the little girl loves her Sophie. Karin, what a lovely, thoughtful gift. I hope your little friend will cherish her blanket for years and years. And hopefully your knee will be right as rain soon. Thank you for bringing this huge project for us. This is a huge investment that you did and I am so grateful to you, I so much enjoyed doing it. 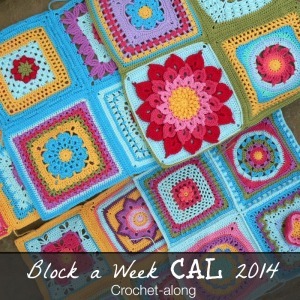 After 30 years of not knit, I saw the project Block A Week CAL 2014, you explain your blog and have so kindly explained line by line with the examples. It helped me to understand the terminology in English. The Sophie’s Universe, I had seen two months late and today I finished it (left only the frame). I even posted a picture Instagram. Because of you, this time it was much easier for me to read the instructions in English and maybe one day, I even try to translate them into Hebrew …. You are a great woman, generous and creative. 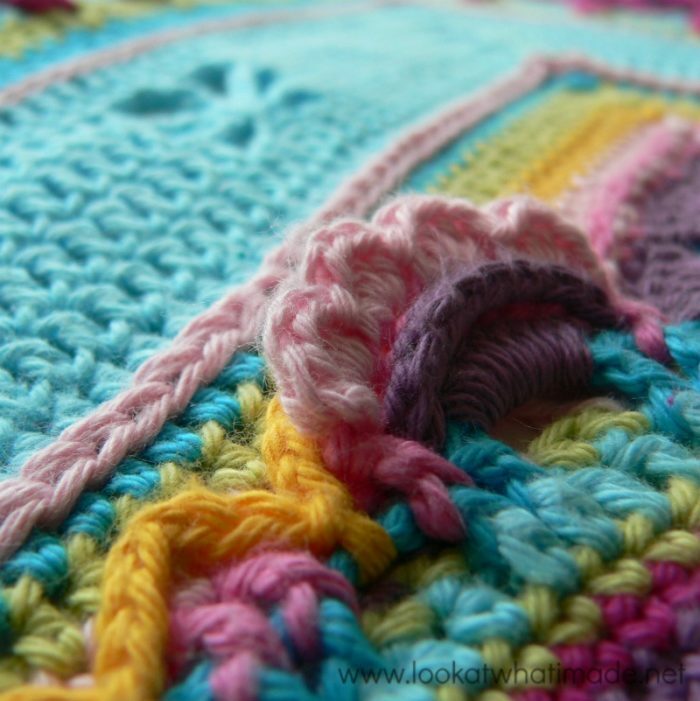 For me, Sophie’s blancket, is one of the amazing projects I’ve seen and done. A huge thank you again and I’ve been waiting for the next project that you will post ….